Aim: A comparative evaluation of the antimicrobial activity of natural extracts of Morinda citrifolia, papain, and aloe vera (all in gel formulations), 2% chlorhexidine gel and calcium hydroxide, against Enterococcus faecalis-an in vitro study. Materials and Methods: The antimicrobial efficacy was assessed in vitro using dentin shavings collected at 2 depths of 200 and 400 μm. The total colony forming units at the end of 1, 3, and 5 days were assessed. Results: The overall percentage inhibition of bacterial growth (200 and 400 μm depth) was 100% with chlorhexidine gel. This was followed by M. citrifolia gel (86.02%), which showed better antimicrobial efficacy as compared with aloe vera gel (78.9%), papain gel (67.3%), and calcium hydroxide (64.3%). There was no statistical difference between data at 200 and 400 μm depth. Conclusion: Chlorhexidine gel showed the maximum antimicrobial activity against E. faecalis, whereas calcium hydroxide showed the least. Among the natural intracanal medicaments, M. citrifolia gel consistently exhibited good inhibition up to the 5 th day followed by aloe vera gel and papain gel. Morinda citrifolia, commercially known as noni, is famous as an important folk medicine and as a health drink. The juice of M. citrifolia has a broad range of therapeutic effects, including antibacterial, antifungal, antiviral, antitumor, antihelminthic, analgesic, hypotensive, anti-inflammatory, and immune-enhancing effects. The effectiveness of M. citrifolia with sodium hypochlorite and chlorhexidine gluconate to remove the smear layer from the canal walls of endodontically instrumented teeth was compared by Murray et al. and it was concluded that 6% M. citrifolia can be used as an endodontic irrigant  (as per article after usage of irrigant regime it was concluded). Till date there is no study to comparatively evaluate the antimicrobial activity of natural extracts of M. citrifolia, papain, and aloe vera (all in gel formulation), 2% chlorhexidine gel and calcium hydroxide, against Enterococcus faecalis. Hence, this study was undertaken to evaluate the disinfection of dentinal tubules when contaminated with E. faecalis using M. citrifolia gel, papain gel, and aloe vera when compared with calcium hydroxide and chlorhexidine gel. The model proposed by Haapasalo and Ørstavik  was modified. One hundred and eighty freshly extracted single rooted teeth were used for this study. A rotary diamond disk was used to decoronate the teeth 5 mm below cementoenamel junction and the apical part of the root to obtain 6 mm of the middle third of the root. Cementum was removed from the root surface. Gates Glidden drills no. 3 (Mani Inc, Tachigi-ken, Japan) in a slow speed handpiece was used to standardize the internal diameter of the root canals. The blocks were treated in an ultrasonic bath of 17% ethylene diamine tetra acetic acid for 5 min followed by 3% NaOCl for 5 min to remove the organic and inorganic debris. The traces of chemicals used were removed by immersing the blocks in an ultrasonic bath containing distilled water for 5 min. All the blocks were sterilized in an autoclave for 2 cycles. The first cycle was at 121°C and the second was with the blocks immersed in 1 mL of tryptone soya (TS) broth in individual microcentrifuge tubes. This allows better penetration of the broth into the dentinal tubules. All the blocks were coated externally with paraffin wax. The test organism used for this study was E. faecalis, which is a gram-positive facultative anaerobic bacterium. E. faecalis (ATCC 29212) was grown in TS agar for 24 h. The culture was suspended in 5 mL of TS broth and incubated for 4 h at 37°C and its turbidity was adjusted to 0.5 McFarland standard. Each dentin block was placed in presterilized microcentrifuge tubes containing 1 mL of the TS broth. Fifty microliters of the inoculum containing the E. faecalis was transferred into each of the microcentrifuge tubes. At the end of 24 h the dentin blocks were transferred into fresh broth containing E. faecalis. All procedures were carried out under laminar flow. Purity of the culture was checked by subculturing 5 μL of the broth from the incubated dentin blocks in TS broth on TS agar plates. Contamination of the dentin blocks were carried out for a period of 21 days. At the end of 21 days the blocks were irrigated with 5 mL of sterile saline to remove the incubation broth. The blocks were assigned into 6 groups (n = 30 dentin blocks). Calcium hydroxide (Sigma-Aldrich, Mumbai, India) was mixed with sterile saline in a ratio of 1.5:1 (wt/vol) to obtain a paste-like consistency. Hydroxy ethyl cellulose (Encore Natural Polymers Pvt. Ltd,Gujarat, India.) was used as a thickening agent in the ratio of 2:1 (vol/wt) for Group 3 (papain raw extract taken from fruit), Group 4 (M. citrifolia raw extract taken from fruit), Group 5 (aloe vera raw extract taken from leaf), and Group 6 (chlorhexidine). The medicaments were placed inside the canals and sealed at both the ends with paraffin wax. They were incubated in an anaerobic environment for 37°C. At the end of 1, 3, and 5 days antimicrobial assessment was carried out with 10 blocks each time. Harvesting of the dentin was carried out at 2 depths (200 and 400 μm) with Gates Glidden drills no. 4 and 5, respectively. The collected dentin shavings were transferred into 1 mL of sterile TS broth and incubated in an anaerobic environment at 37°C for 24 h. After 24 h, the contents of each tube was serially diluted, 100 μL of the broth in 100 μL of sterile saline for 5 times. Fifty microliters of the dilution was then plated on TS agar plates and incubated for 24 h. Colonies were counted and readings were tabulated as shown in [Table 1]. The data were statistically analyzed with one-way analysis of variance followed by Tukey multiple comparison means to check the difference in bacterial inhibition between the groups (P < 0.05). The paired t test was used to check for differences in growth at different time intervals within groups and for differences at the 2 depths (P < 0.05). The current study showed that all the 5 medicaments studied exerted antibacterial activity. Contamination of the dentin blocks was confirmed when debris samples harvested from the saline group (negative control) yielded positive growth. [Table 1] shows the antibacterial activity, measured at 2 depths (200 and 400 μm) and at 3 time intervals (1, 3, and 5 days). The inhibition of growth in all the groups was statistically significant in comparison to the control group (saline). Group 6 (2% chlorhexidine gel) was the most effective against E. faecalis to the depth of 400 μm on all days of incubation. Intergroup comparison of inhibition between groups 4 and 5 (M. citrifolia gel and aloe vera gel) showed no statistical difference on day 1, but on days 3 and 5 there was a statistically significant difference. Inhibition in Group 4 (M. citrifolia gel) was also statistically significant compared with groups 3 and 2 (papain gel and calcium hydroxide, respectively) on all days (1, 3, and 5). Inhibition in Group 3 (papain gel) was statistically better than Group 2 (calcium hydroxide) on day 3, whereas on days 1 and 5 they had similar efficacy. The inhibition of growth of E. faecalis at 200 and 400 μm was uniform with no statistically significant difference for all the groups. The inhibition of growth of E. faecalis at the end of days 1, 3, and 5 was varied with different medicaments. Group 2 (calcium hydroxide) showed sufficient antibacterial activity on day 1, which decreased on day 3 and again increased by day 5. Group 3 (papain gel) showed a decrease in antibacterial activity at the end of day 5. Group 4 (M. citrifolia gel) showed constant antimicrobial efficacy on all the days (1, 3, and 5 days). Group 5 (aloe vera gel) showed comparable antibacterial activity to M. citrifolia gel on first day, but there was a gradual decrease in the efficacy by the end of day 5. To summarize the results, the overall percentage inhibition at 2 depths and different time intervals was, 100% with chlorhexidine gel ,86.02% with M. citrifolia gel, 78.9% with aloe vera gel, followed by 67.3% papain gel and 64.3% with calcium hydroxide [Figure 1]. Currently, the use of natural extracts in dentistry has gained importance both to patients and endodontic professionals as the shift is toward natural health remedies. Hence the use of an intracanal medicament made of natural extracts is of great significance. The in vitro model developed by Haapasalo and Ørstavik  has been used to assess the efficacy of endodontic medicaments in the disinfection of dentinal tubules. Lynne et al. modified this model to include quantitative analysis of bacteria in the dentin tubules to define a percentage of reduction in colony forming units in infected dentin before and after the application of intracanal medication preparations. This study reveals the effect of newer organic intracanal medicaments (when used as raw extracts) against E. faecalis. 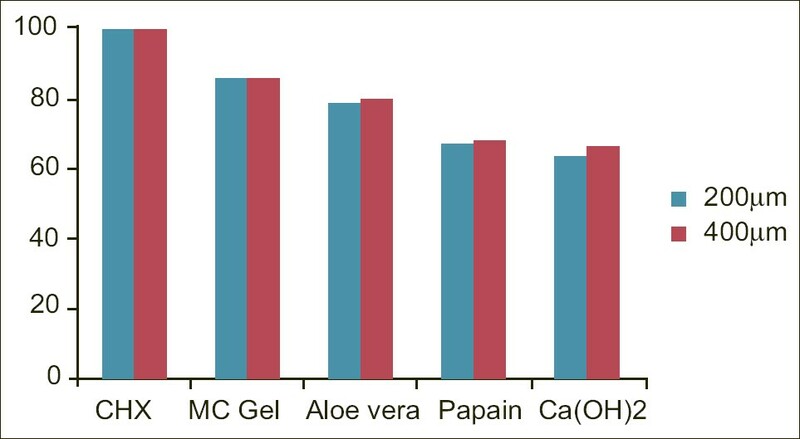 On an average, chlorhexidine gel showed maximum inhibition of E. faecalis at depths of 200 and 400 μm followed by M. citrifolia gel (86.02%), and aloe vera gel (78.9%). Levels of inhibition of papain (67.3%) and calcium hydroxide (64.3%) were somewhat comparable. In the present study, chlorhexidine gel showed 100% inhibition at depths of 200 and 400 μm from day 1 to 5. The reason could be due to the bactericidal dosage of 2% and increased diffusion of the medicament into the dentinal tubules. Basrani et al. showed that 2% chlorhexidine gel produced a better antimicrobial action as compared to 0.2% chlorhexidine gel or calcium hydroxide mixed with 0.2% chlorhexidine. M. citrifolia gel showed 86.02% inhibition at depths of 200 and 400 μm from day 1 to 5. Murray et al. claim that the presence of l-asperuloside and alizarin may be responsible for the antibacterial and antimicrobial property of M. citrifolia. The efficacy of M. citrifolia gel remained the same over the 5-day period. This improved performance could be attributed to the increased contact time and physical contact of the gel. These results are in accordance with another study conducted by Wang et al.,  wherein 2% chlorhexidine solution when converted into gel form performed better than the solution alone. Further studies are needed to determine the optimum concentration of M. citrifolia required when used in gel form as an intracanal medicament against E. faecalis. Chlorhexidine gel showed the maximum antimicrobial activity against E. faecalis, whereas calcium hydroxide showed the least. Among the natural intracanal medicaments, M. citrifolia gel consistently exhibited good inhibition up to the day 5 followed by aloe vera gel and papain gel. 1. Lee Y, Han SH, Hong SH, Lee JK, Ji H, Kum KY. Antimicrobial efficacy of a polymeric chlorhexidine release device using in vitro model of Enterococcus faecalis dentinal tubule infection. J Endod 2008;34:855-8. 2. Manzur A, González AM, Pozos A, Silva-Herzog D, Friedman S. Bacterial quantification in teeth with apical periodontitis related to instrumentation and different intracanal medications: A randomized clinical trial. J Endod 2007;33:114-8. 3. Safavi KE, Spangberg LS, Langeland K. Root canal dentinal tubule disinfection. J Endod 1990;16:207-10. 4. Chong BS, Pitt Ford TR. The role of intracanal medication in root canal treatment. Int Endod J 1992;25:97-106. 5. Siren EK, Haapasalo MP, Ranta K, Salmi P, Kerosuo EN. Microbiological findings and clinical treatment procedures in endodontic cases selected for microbiological investigation. Int Endod J 1997;30:91-5. 6. Portenier I, Waltimo T, Ørstavik D, Haapasalo M. The susceptibility of starved, stationary phase, and growing cells of Enterococcus faecalis to endodontic medicaments. J Endod 2005;31:380-6. 7. George S, Kishen A, Song KP. The role of environmental changes on monospecies biofilm formation on root canal wall by Enterococcus faecalis. J Endod 2005;31:867-72. 8. Delany GM, Patterson SS, Miller CH, Newton CW. The effect of chlorhexidine gluconate irrigation on the root canal flora of freshly extracted necrotic teeth. Oral Surg Oral Med Oral Pathol 1982;53:518-23. 9. de Souza-Filho FJ, Soares Ade J, Vianna ME, Zaia AA, Ferraz CC, Gomes BP. Antimicrobial effect and pH of chlorhexidine gel and calcium hydroxide alone and associated with other materials. Braz Dent J 2008;19:28-33. 10. Murray PE, Farber RM, Namerow KN, Kuttler S, Garcia-Godoy F. Evaluation of Morinda citrifolia as an endodontic irrigant. J Endod 2008;34:66-70. 11. Otuka ES, Pedrazzani ES, Pioto MP. The use of papain in plantar ulcers. Rev Bras Enferm 1996;49:207-14. 12. Maragakis GM, Hahn P, Hellwig E. Chemomechanical caries removal; a comprehensive review of literature. Int Dent J 2001;51;291-9. 13. Newall CA, Anderson LA, Phillipson JD. Herbal medicines. A guide for health-care professionals. London: The Pharmaceutical Press; 1996. 14. Haapasalo M, Ørstavik D. In vitro infection and disinfection of dentinal tubules. J Dent Res 1987;66:1375-9. 15. Krithikadatta J, Indira R, Dorothykalyani AL. Disinfection of dentinal tubules with 2% chlorhexidine, 2% metronidazole, bioactive glass when compared with calcium hydroxide as intracanal medicaments. J Endod 2007;33:1473-6. 16. Miyamoto T, Takahashi S, Ito H, Inagaki H, Noishiki Y. Tissue biocompatibility of cellulose and its derivatives. J Biomed Mater Res 1989;23:125-33. 17. Dametto FR, Ferraz CC, Gomes BP, Zaia AA, Teixeira FB, de Souza-Filho FJ. In vitro assessment of the immediate and prolonged antimicrobial action of chlorhexidine gel as an endodontic irrigant against Enterococcus faecalis. Oral Surg Oral Med Oral Pathol Oral Radiol Endod 2005;99:768-72. 18. Little JW. Complementary and alternative medicine: Impact on dentistry. Oral Surg Oral Med Oral Pathol Oral Radiol Endod 2004;98:137-45. 19. Bystrom A, Claesson R, Sundqvist G. The antibacterial effect of camphorated paramonochlorophenol, camphorated phenol and calcium hydroxide in the treatment of infected root canals. Endod Dent Traumatol 1985;1:170-5. 20. Lynne RE, Liewehr FR, West LA, Patton WR, Buxton TB, McPherson JC. In vitro antimicrobial activity of various medication preparations on E. faecalis in root canal dentin. J Endod 2003;29:187-90. 21. Pirani C, Bertacci A, Cavrini F, Foschi F, Acquaviva GL, Prati C, et al. Recovery of Enterococcus faecalis in root canal lumen of patients with primary and secondary endodontic lesions. New Microbiol 2008;31:235-40. 22. Basrani B, Tjäderhane L, Santos JM, Pascon E, Grad H, Lawrence HP, et al. Efficacy of chlorhexidine- and calcium hydroxide-containing medicaments against Enterococcus faecalis in vitro. Oral Surg Oral Med Oral Pathol Oral Radiol Endod 2003;96:618-24. 23. Wang CS, Arnold RR, Trope M, Teixeira FB. Clinical efficiency of 2% chlorhexidine gel in reducing intracanal bacteria. J Endod 2007;33:1283-9. 24. Atherton P. Aloe vera revisited. Br J Phytother 1998;4:176-83. 25. Foreman PC, Barnes IE. Review of calcium hydroxide. Int Endod J 1990;23:283-97. 26. Gomes BP, Souza SF, Ferraz CC, Teixeira FB, Zaia AA, Valdrighi L, et al. Effectiveness of 2% chlorhexidine gel and calcium hydroxide against Enterococcus faecalis in bovine root dentine in vitro. Int Endod J 2003;36:267-75.